Delhi, the proud capital of our country and one of the first cities to be declared as a Metro. Apart from being the centre of the most important Govt. buildings, the city is also famous for its rich past and its share of historical monuments. That combined with the pleasant climate and the buzz of activity, makes Delhi a popular place to move to for job opportunities. Print the agreement on Stamp paper of due value. The owner and the tenant should sign the agreement in the presence of two witnesses. Register the agreement at the sub-Registrar office paying the appropriate registration fees. Purchase stamp paper of recommended value, print your draft on the stamp paper. Alternatively, you can use our Rental Agreement Service and we will do it all for you. Stamp Duty – It is the duty paid to the Government whenever an agreement or transaction is created. Stamp Duty is calculated on the basis of the value of the transaction. It is paid to the Government by purchasing Stamp paper of due value. There are two kinds of Stamp papers: the traditional Stamp paper and the e-Stamp paper. Delhi has dropped the conventional stamp paper systems and shifted entirely to the e-Stamping system operated by Stock Holding Corporation of India (SHCIL). If a person needs Stamp paper he can approach the e-Stamping vendors and purchase it from them. You need to provide your name and the purpose in the application form. 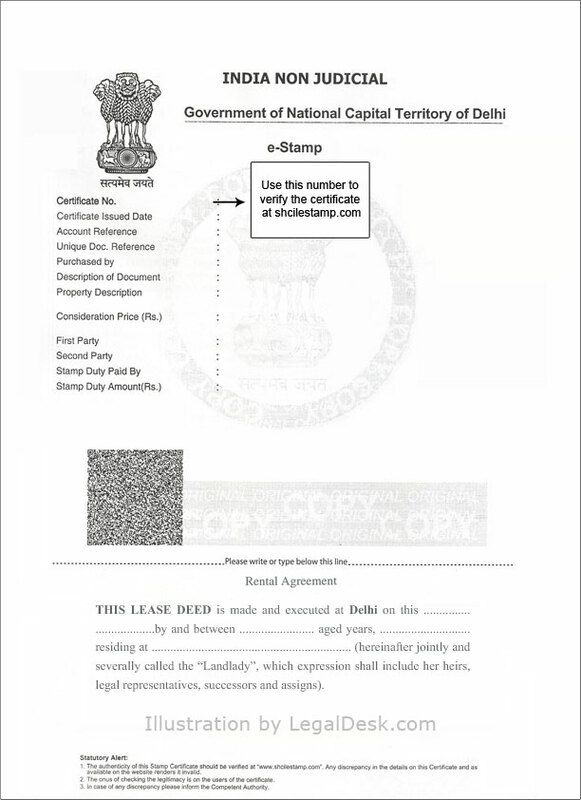 The conventional Stamp papers are no longer used in Delhi. Registration of the lease/rental deed in Delhi has certain procedure that needs to be followed by all. A Demand Draft (DD) of Rs. 1100 needs to be taken for the Registration charges. Aadhar card or the receipt received while applying for it, if the person is an Indian. If the person is a foreigner, then original passport is needed. If the tenant is a company, then the person coming for the registration should bring a board resolution/ authorisation letter from the company mentioning the person’s right to register the lease, along with the company seal. If one person represents the another person for the registration, then the Power of Attorney deed should be brought. Is Notarization Of Rental Agreement Required? Some folks opt for Notarisation of the rental agreements but Notarisation is not registration. Hence a Notarised rental deed is never a replacement for a registered deed. Courts do not accept them as evidence in case of disputes. Even if the deed is Notarised, you still need to register it. The reason given for Notarisation by many Stamp Vendors is that the unregistered document will be considered a legal address proof with Notary seal, but there is no legislation to state so. Notary seal simply states that you have attested it in front of a Notary Public. In Delhi, the typical duration for rentals is 11 months with provision to renew at the end of 11th month. The tenant has to pay a monthly rent. In addition to that, the electricity and water charges are also to be paid. Maintenance charges are also to be paid for cleaning common amenities and maintaining the premises. Another popular mode of renting is on a long term lease for a certain number of years. There is no monthly rent payable by the tenant. At the end of the term of lease the owner has to return the lease amount to the tenant. Electricity, water and maintenance charges have to be paid regularly by the tenant. There is no interest paid on the lease amount. The procedure of registration and Stamp Duty are the same as residential properties for renting of the Commercial properties also. The procedure for registering a commercial lease and the Stamp Duty associated with it are similar to that for rental agreements. Lock-in period – The period before which neither the Owner nor the tenant can terminate the agreement. Pets – Whether the tenant can have pets in the rental property. Overstay – If the tenant continues to stay in the rental property even after the agreement term has ended the owner can charge on per day basis. Penalty for late payment – If the tenant fails to pay the rent on the scheduled date, a small penalty or fine can be charged by the owner. Painting, maintenance and repairs – are to be included in the agreement mentioning clearly the duties of the landlord or owner and that of the tenant. Food habits – The owner should be open about disclosing whether the tenant can cook non-veg food in the premises. If these clauses are included there will be no unnecessary disputes between the landlord and tenant in future. Whether you are directly dealing with the owner or any third party impersonating as the owner. Whether there is an agent or broker to whom you need to pay any brokerage or commission charges. Usually the brokerage or commission is half or full one month rent. Verify whether the property belongs to the person who claims to be the owner. For this you can check the Electricity or Tax bill. In case you pay any token advance make sure you are given a receipt by the owner. Or make it through cheque, DD or online transfer. Talk all terms and conditions initially itself. There should be a clear written agreement including the important terms and conditions between the owner and tenant. The agreement should be printed on a Stamp paper of due Government values. The house or flat should be neatly painted and handed over to the tenant by the owner in good condition. While vacating the premises the tenant shall do the same. Register the agreement in the Sub-Registrar office by paying the registration charges whatever be the term of agreement. A registered agreement is always safe and legally valid. Tenant verification at a local police station is compulsory for landlords in Delhi. The Landlord has to provide the details of the tenant to the police and the tenant also has to co-operate in this regard. Failure to do so is punishable under the law. Deposit – In Delhi, the usual trend is to collect 2 to 3 months worth of rent as security deposit. This deposit is to be refunded by the owner to the tenant at the time of the tenant vacating the premises. No interest is paid on deposit amount. Token Advance – At the time of blocking the house for rent, the tenant sometimes pays a small token advance to the owner. This is to prevent the owner entertaining other potential tenants. The token advance blocks the property until such time as either party backs out. Once the token advance is given, it is understood that both parties are ready to enter into the agreement. But if either of the party backs out from proceeding further, then that party has to make good the loss to the other party. Ashok is the owner of a 2 bedroom house. He lets it out on monthly rent of Rs. 8000/- to Mahesh for a period of 11 months. The security deposit is Rs.50000/-.They make a rental agreement on a 50 rupees Stamp paper. Things go well till 5 months. Mahesh pays rent till 5 months after which he stops paying the rent and also refuses to move out. Ashok immediately approaches the Court. The Court impounds the agreement for deficit Stamp Duty paid and imposes the fine of up to 10 times the Stamp Duty to be paid. So what will be the penalty Ashok has to pay? Let us calculate. Hence Ashok will have to pay Rs. 18600/- to the Court as fine for non payment of Stamp Duty. But if Ashok has initially made the agreement by paying the proper Stamp Duty he would have had to pay only Rs. 1860/- Hence it is always recommended that you pay the appropriate Stamp Duty and be relaxed. An unregistered rental deed is never an evidence in the Courts. It is just a collateral evidence and cannot be used to prove one’s claims. Hence, Registering rental agreement is very essential to be on the safer side. Amit let out his flat for rent to Vikas. He made the agreement on Stamp paper of due value. But he did not register it at the Sub-Registrar office. The agreement was signed by both. For the first 4 months, Vikas paid the rent properly. the rent was fixed at Rs. 5000/-. After 4 months, Vikas stopped paying the rent. Amit approached the Court. Though his agreement was properly Stamp Duty paid, the Court refused to accept the deed as evidence. Vikas claimed that the rent was only 1500 and not 3500/- as claimed by Amit. He also refused to have signed the deed and completely denied making any agreement with the owner. Since the document was not registered, it could never be used as an evidence and for lack of evidence Amit had to lose the fight. While this article explains the nitty gritty of rental agreement procedure, now you can make your agreement and get it delivered with Stamp paper. 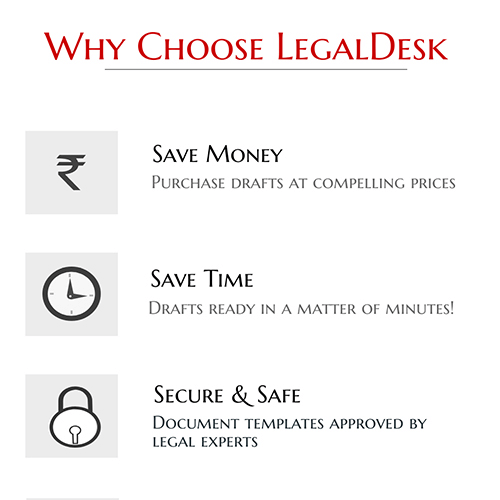 LegalDesk offers pre-drafted, ready to use, lawyer verified rental agreement. All you need to do is fill in your details and we will do the rest. We also offer the option to print your document on stamp paper and deliver it to an address of your choice. If you are looking for rental agreements for Noida and Gurgaon we have the them as well!